Weltweite Lesung für Edward Snowden. The ilb calls for a worldwide reading for Edward Snowden, aiming for the retraction of the prosecution against the Whistleblower in the USA and for safe international conduct for him and his relatives. This appeal also includes the recommendation to award him with the Nobel Peace Prize. 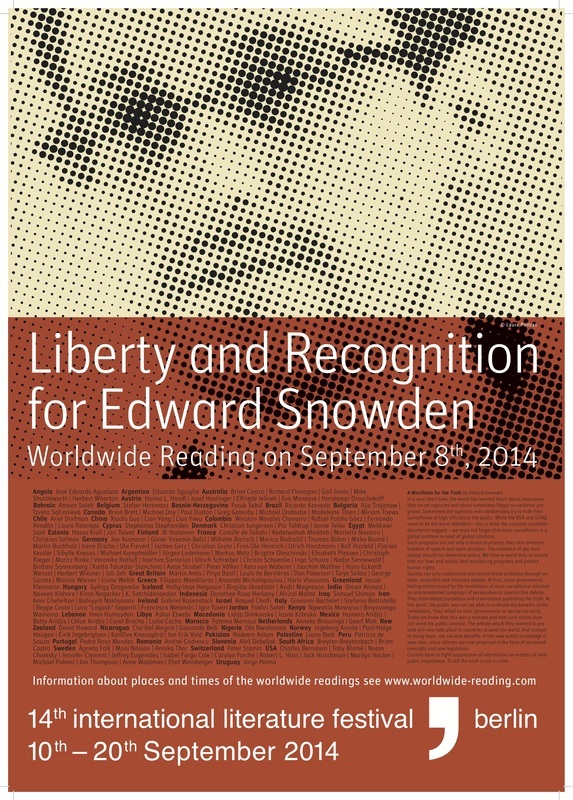 The international literature festival Berlin (ilb) and Authors for Peace call on all individuals, institutions, schools and media outlets that care about freedom and civil rights to participate in a worldwide reading of texts about surveillance in support of Edward Snowden, on 8th September 2014. On 5th June 2013 the Guardian published the first of a long series of articles exposing the extent of mass surveillance being conducted by states and corporations worldwide, in particular the American National Security Agency (NSA) and the British intelligence agency Government Communications Headquarters (GCHQ). New information taken from the top-secret files of these agencies continues to be revealed, detailing how millions of innocent citizens are being digitally tailed as suspects. Data about our phone calls, online chats, text messages, web searches, social media use – all the means through which we daily conduct our lives – is collected, analyzed and stored. One man alone was responsible for disclosing these shocking violations to the public; his name is Edward Snowden. A former employee of the NSA, Snowden had become increasingly disillusioned and alarmed by the scope of surveillance and the illegal methods being used. He realized, “I do not want to live in a world where everything I do and say is recorded. That is not something I am willing to support or live under.” Unsuccessful attempts to influence the system from within pushed Snowden to take the only other route available to call attention to these gross infractions: whistleblowing. Knowing he might never again see his friends, family or country, Edward Snowden left his life and all comforts behind in the United States, carrying with him nothing except for four laptops within which were some of the National Security Agency’s most highly classified secrets. These leaks were shared with the world through careful collaboration with responsible newspapers. They have sparked a long overdue global debate about democracy and human rights in the digital age. Corporations have come under scrutiny for their brazen exploitation of consumers’ data. Citizens everywhere are waking up to the fact that there is no freedom without privacy and are demanding the right to live without being constantly observed. As a result, governments around the world are increasingly forced to review their own surveillance systems and, in some cases, acknowledge their complicity with the NSA. Edward Snowden disclosed his identity soon after the first leaks were published because he wanted to protect anyone else from being implicated. He said: “I have no intention of hiding who I am, because I know I have done nothing wrong.” The ILB wholeheartedly endorses this claim and asks all citizens to do so as well by joining in the worldwide reading for a man who has done humanity a great service. With this worldwide reading, we call on the United States Government to recognize that Edward Snowden's revelations are of essential importance for the safeguarding of democracy in the digital age, and thus that his actions must be seen to be covered by the Universal Unwritten Rule of the Ethical Right. Washington should therefore immediately lift all legal charges and complaints against Snowden, so that he can return home safely as a free man. Finally, we ask that the Nobel Committee consider Edward Snowden for the Nobel Peace Prize – in recognition of his amazing, selfless service towards democracy, freedom and peace for all of us. Nobelkomitee: Snowden für den Friedensnobelpreis in Betracht ziehen. Am 6. Juni 2013 veröffentlichte der „Guardian“ den ersten einer langen Reihe von Artikeln über die weltweit von Staaten und Unternehmen betriebene Massenüberwachung. Im Zentrum standen die amerikanische National Security Agency (NSA) und der britische Geheimdienst Government Communications Headquarters (GCHQ). Nach wie vor werden Informationen aus den höchst vertraulichen Akten dieser Agenturen publiziert. Sie zeigen, dass Millionen unschuldiger Bürgerinnen und Bürger als Verdächtige digital verfolgt werden. Daten aus unseren Telefongesprächen, Online-Chats, SMS, Websuchen und der Nutzung der sozialen Medien – also all das, was Teil unseres täglichen Lebens ist – werden gesammelt, analysiert und gespeichert. Dank sorgfältiger Kooperation mit verantwortungsbewussten Zeitungen konnten diese Informationen an die Öffentlichkeit gelangen. Sie lösten die längst fällige globale Diskussion über Demokratie und Menschenrechte im digitalen Zeitalter aus. Unternehmen gerieten wegen ihrer skrupellosen Verwertung von Kundendaten ins Blickfeld. Bürgerinnen und Bürger weltweit wachten auf und nahmen zur Kenntnis, dass es ohne Datenschutz keine Freiheit gibt: Sie forderten das Recht auf ein Leben ohne permanente Beobachtung. In der Konsequenz sahen sich die Regierungen aller Lände gezwungen, ihre Überwachungssysteme zu überprüfen. Einige mussten zugeben, dass sie mit der NSA zusammenarbeiteten.